Guess Who's B-day it is Today?!?! HOPE THIS SPECIAL DAY WOULD BE FULL OF SPECIAL SURPRISES!! those are so kind of you, hannah, i made a gift as well, but its not as great as yours but today is about, SAGGE, a great and lovable friend to many one of us!!! like me so yeah. HAPPY BIRTHDAY, SAGEE!!! 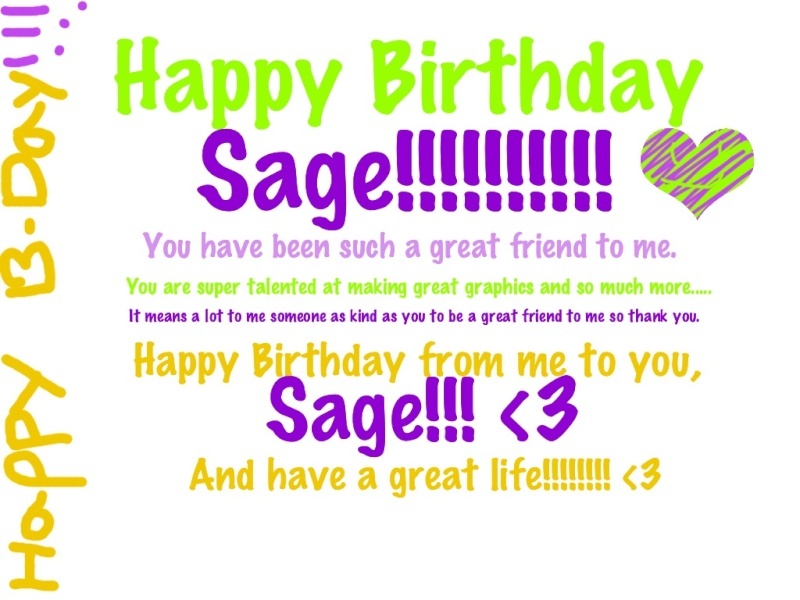 here is a gift for ya, sage, if ya didnt get it and yeah, just want to say, have an amazing birthday!!!! Awwww Thank you to the both of You!!! I love those graphics<3 So cute and so thank you so much!! Subject: Re: HAPPY BIRTHDAY SAGE! !